created from DTI. Image courtesy of Dr. Erin Hecht. 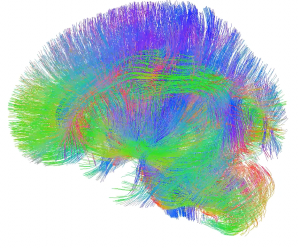 The National Chimpanzee Brain Resource (NCBR) has the aim of facilitating research advancement through the collection and distribution of chimpanzee neuroimaging data and postmortem brain tissue. The NCBR also serves as a portal to access chimpanzee brain atlas tools, data repository, bibliography of publications, educational information, and links to other chimpanzee brain resources and datasets on the Internet. The NCBR is operated in partnership by the George Washington University, the University of Texas MD Anderson Cancer Center, and Yerkes National Primate Research Center, and is supported by the National Institute of Neurological Disorders and Stroke.